Roosevelt County chief deputy sheriff Corey Reum was one of the first responders to the recent Bakken oil train derailment in Montana, a few miles from the North Dakota border. “We’re lucky it didn’t ignite,” Reum told ABC News. That is just one of the things first responders have learned since the deadly accident two years ago in Lac-Megantic. As a Globe and Mail article marking that two year anniversary recently noted, when the train was on fire and rail cars were exploding in Lac-Megantic, no one could figure out why. The Globe detailed the questions the investigators were trying to answer in the aftermath. And, perhaps most puzzling of all: How did the crude oil on the train – normally thought of as difficult to light on fire – cause the kind of violent explosions it did? Now we know that the Bakken oil is different from most other crude, and based on the eight accidents since July 2013 involving derailed trains that involved Bakken oil and resulted in fires, first responders now know the risk the Bakken oil presents. In Roosevelt County they evacuated a half-mile perimeter around the crash site as a precaution even though there was no fire. However, despite the lack of fire in this latest accident, 35,000 gallons of oil did spill as four tank cars ruptured. And these were the newer CPC-1232 tank cars that the oil industry is currently suing to keep on the rails even longer than the new regulations allow — which for some 1232 tank cars is not until 2025. There have now been six accidents involving oil trains in 2015 where tank cars derailed and were punctured and oil was spilled. In the first five, there were also fires and explosions. All six oil train derailments involved the new 1232 model cars that the American Petroleum Institute is suing to keep on the tracks longer than existing long timelines in the new oil-by-rail regulations. Even Cynthia Quarterman, the former administrator of the Pipeline and Hazardous Materials Safety Administration, the agency responsible for the regulations, was surprised by the timelines in the final regulations. So while we have learned quite a bit in the two years since Lac-Megantic, not much has changed in how Bakken oil is moved by rail. The oil industry has not addressed the volatile nature of the Bakken oil so it still presents serious fire and explosion risks. The oil and rail industries are fighting the new regulation requirements for modern braking systems on the trains starting in 2021. The oil will still be transported in the obviously inadequate CPC-1232 cars for up to ten years or longer if the oil industry wins its lawsuit. So, as Sheriff Reum pointed out in his observation, the best strategy for communities along the oil train tracks across North America is to spend the next ten years or so hoping you get lucky. Image credit: NTSB Safety Recommendation report. The light crude oil known as Bakken comes from fracking a geologic formation of that name under North Dakota, Montana and Canada. Less dense and with less carbon, light crudes yield more gasoline than heavier crudes, but also are more volatile. Trains crash. That fact hit home last week when a passenger train derailed in Philadelphia and also last year, on Nov. 26, when a cargo train derailed in the Feather River Canyon. 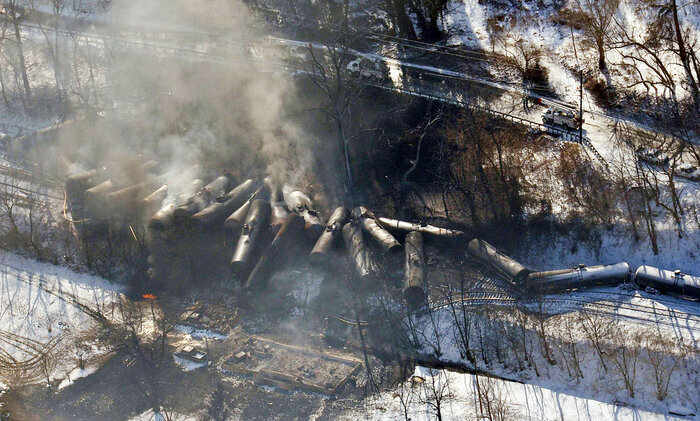 The risk of devastation multiplies when the derailed train carries volatile crude oil. A recent spate of those accidents has garnered national attention, too, prompting the U.S. Department of Transportation (DoT) to release new regulations governing the conveyance of flammable liquids. The measures have drawn near-unanimous opposition, though, and done little to assuage lingering local fears. The International Association of Fire Fighters also has voiced objections. Representing more than 300,000 firefighters in North America, the IAFF protested a provision that allows railroads to keep the contents of their trains confidential—under the banner of national security. Russ Fowler, battalion chief with Cal Fire Butte County and coordinator of the local Interagency Hazardous Materials Team, has additional concerns. DoT regulations phase out tank cars that are not up to the current safety standard, rather than pull them off the rails for retrofitting or retirement. Transportation Secretary Anthony Foxx has argued that the alternative would result in increased oil-tanker traffic on highways. Cal Fire has communicated with BNSF Railway, Fowler said, and has been told no crude oil deliveries have come through Butte County this year. “I have no reason not to believe them,” he added, though he’s seen DOT-111s riding on Chico tracks. That’s in contrast with last year, when train cars carrying millions of gallons of the explosive oil, reportedly around one shipment per week, did make their way way along the Feather River Canyon. Experts tie the reduction of imports to a reduced demand for the fuel, a lighter type that’s similar to gasoline and thus extremely volatile. While Cal Fire dreads the prospect of an urban crash, the Feather River Canyon presents a distinct set of frets. Train tracks head into remote areas that are difficult for emergency responders to reach. Access roads don’t always run adjacent to the rail route—not even parallel in certain spots. Depending on where a crash occurred, spilled oil could contaminate the Feather River and Lake Oroville—a major source of water for California—or could start a forest fire should it ignite. For Supervisor Doug Teeter, the board chair who represents the Ridge, that’s little assurance. He has a powerless feeling—believing “it’s just a matter of time” before an accident happens locally, yet knowing “as a county we have no control” over the rails. Either in populated or unpopulated areas. Should legal challenges fail, and in the absence of local authority, a remedy to the DoT regulations remains: Congress. Teeter recently met with a representative of Sen. Barbara Boxer. Meanwhile, North State Congressman John Garamendi has introduced legislation to make light crude safer for rail transport. Teeter encourages constituents to write congressional representatives and senators. He finds encouragement even in the controversial DoT regulations, which arose amid an uproar.